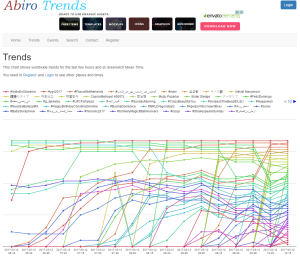 Abiro Trends provides information about Twitter trends over time. Abiro Trends provides a quick overview of Twitter trends over time. It samples worldwide and U.S. trends every 15 minutes and regional trends a couple of times per day for easy and quick browsing. See Twitter trends graphically for the region and time period, and with the time windows you are interested in. Set up events, for trends reaching a certain level, or increasing or decreasing at a certain pace. You’ll receive an e-mail when events occur. Manage your trends, events and user profile via an easy to use interface. Export trends to CSV files for off-line analysis in Excel etc. Trend data is kept for one week back in time. It was specified and initially implemented by Abiro during 2012 and improved over time.